At the summit of a small hill in the Veneto pre-alps it is rather surprising to come across a solitary vending machine under a wooden shelter. This however is no ordinary dispenser, nor indeed an ordinary hill for that matter. 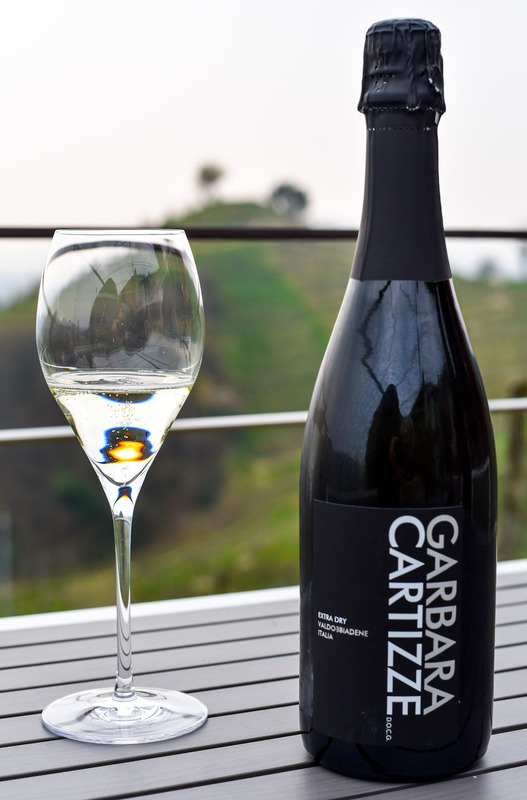 The goods dispensed are full size bottles of Prosecco and the hill is the famous Colline del Cartizze. 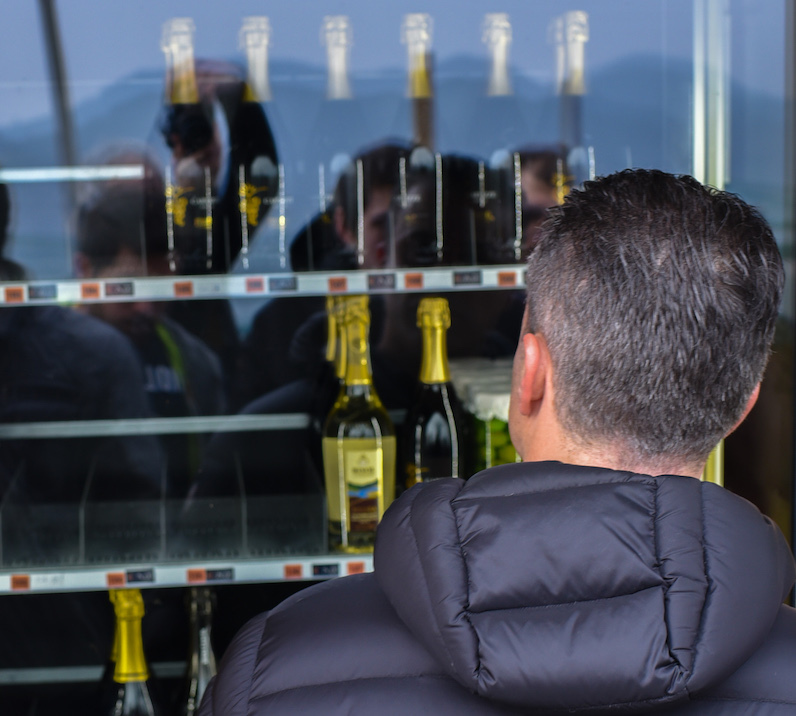 There are no shortage of visitors on this sunny March weekend, with a ragged queue waiting to access the machine and pop a bottle of their favourite fizz. It’s a great spot for it as well – scattered wooden benches sit across the small hilltop where the Prosecco also helps to wash down the standard local’s alfresco picnic of fresh bread accompanied by lumps of hard local cheese and stunning view. 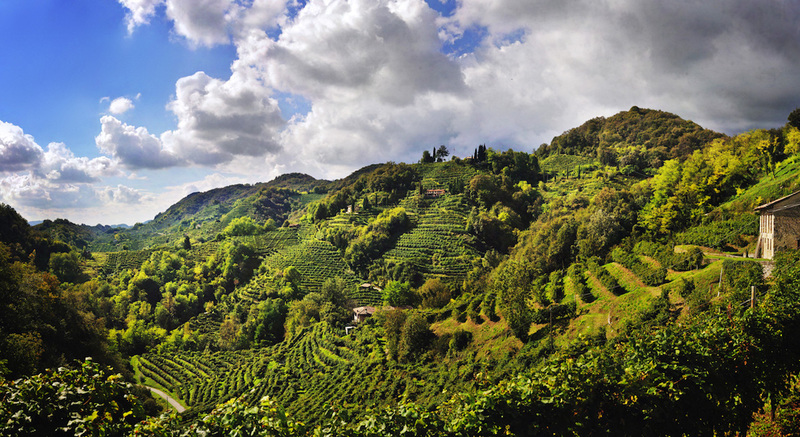 The hill itself represents the holy grail of Prosecco production – a small but celebrated location that gives its name to a small DOCG within a much larger regional zone. 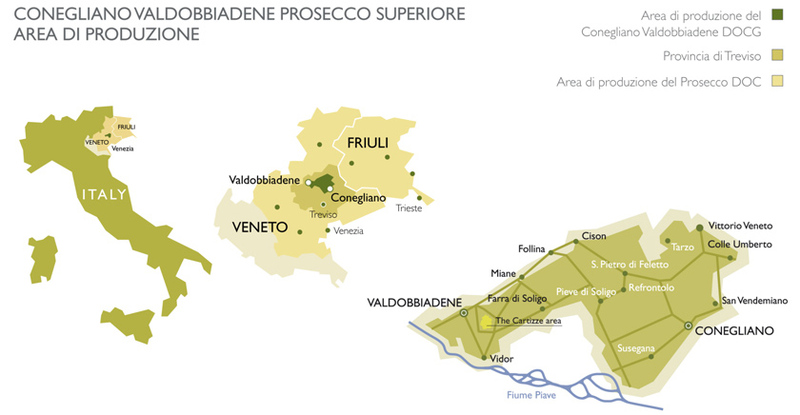 The bulk of Prosecco DOC is grown on low-lying plains in an extended area covering 20,000 hectares however, between the communes of Conegliano and Valdobbiadene, a Superiore DOCG (Denominazione di Origine Controllata e Garantita – controlled and guaranteed designation of origin) is grown exclusively on hillside vineyards in an area totaling less than 7,000 hectares. The steepness of the terrain means that everything from pruning to picking is principally done by hand, necessarily increasing the quality of wine produced. 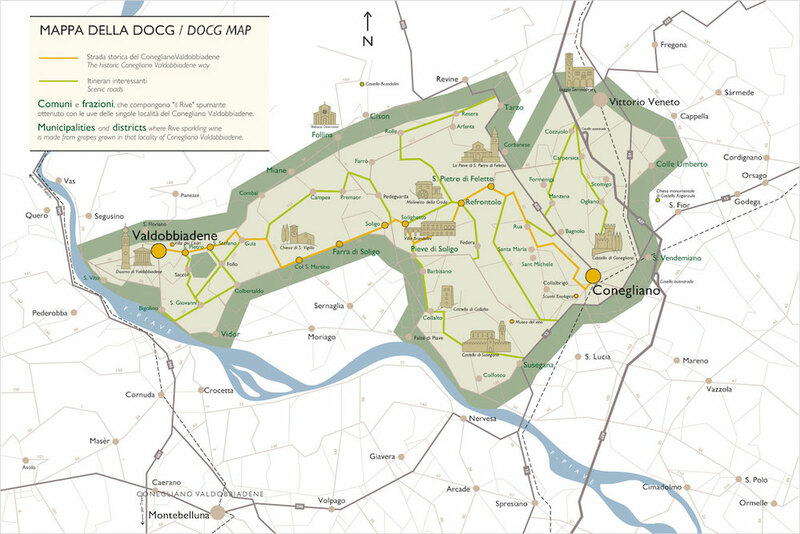 Within this DOCG area the Colline del Cartizze, visible on even the oldest land registry maps of Treviso, maintains a tradition of vine cultivation going back a thousand years. The Glera grapes ripen slowly on its stony and chalky terrain whilst the south-east facing slopes capture the warm spring sun and shelter the vines from the high temperatures of summer afternoons. The soil is dry and rich in micro-elements and minerals that impart the grapes with a characteristic and unique flavours. 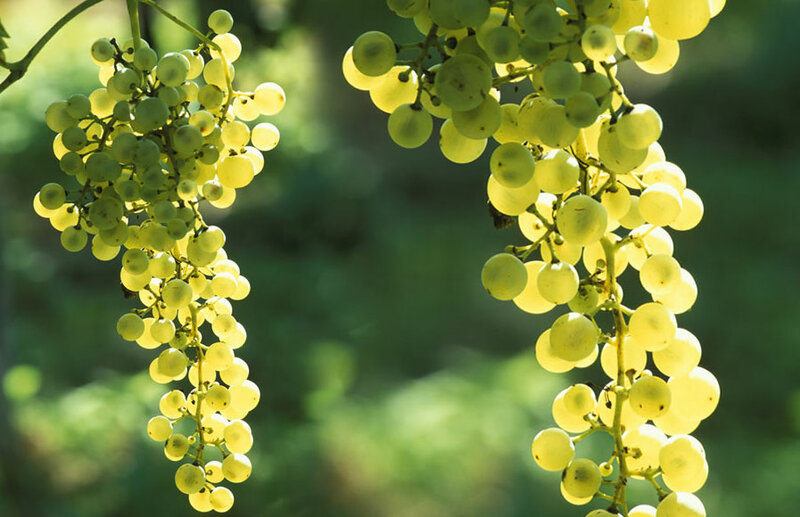 The bunches are sparse and the grapes themselves are small, aromatic, and exceptionally sweet. It goes without saying that land here is at a premium and with just 107 hectares of Cartizze production this is some of the most desirable wine-growing land in the world. Mico Grotto at the Garbara winery showed us around his patch of Cartizze. 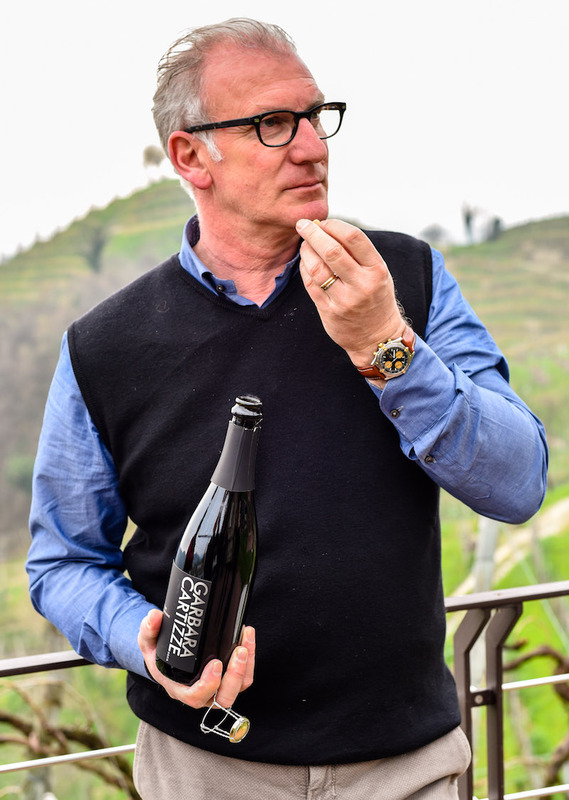 He revealed local producers have sought to further enhance the exclusivity of the area – despite recent privileges allowing the more exclusive designation DOCG – by naming it simply Superiore di Cartizze, without mentioning Prosecco. Mico provided a tasting of two of his wonderful wines – Valdobbiadene Superiore di Cartizze, DOCG, extra dry – a full, lightly straw-coloured wine, floral with the added roundness of ripe fruit. His other is a millesimato (annual vintage) Prosecco Superiore di Valdobbiadene, DOCG – brut, lightly straw-coloured wine dry, with a fresh acidity, floral and fruity. These are the elite of local wines, not easily found in our local supermarkets, but well worth seeking out for their superior qualities. 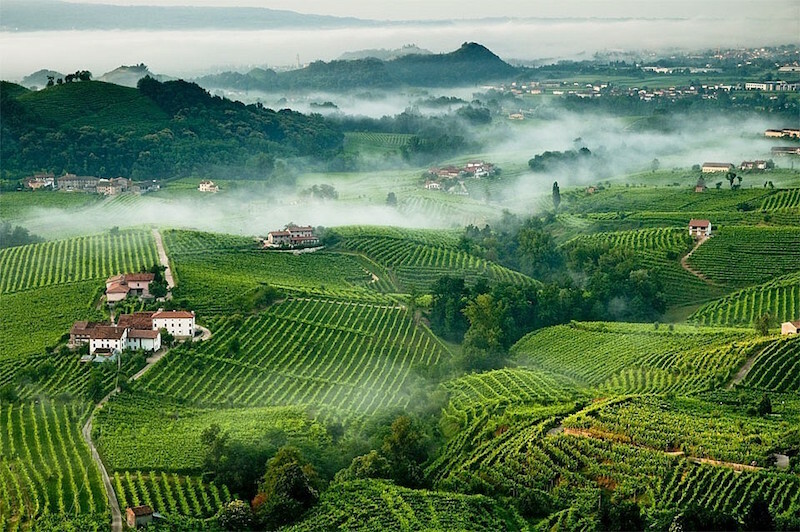 The nearby village of Valdobbiadene lies at one end of of the oldest wine route in Italy – the Strada del Prosecco – a beautiful stretch of winding road almost entirely decorated by vineyards, abbeys, churches and castles. 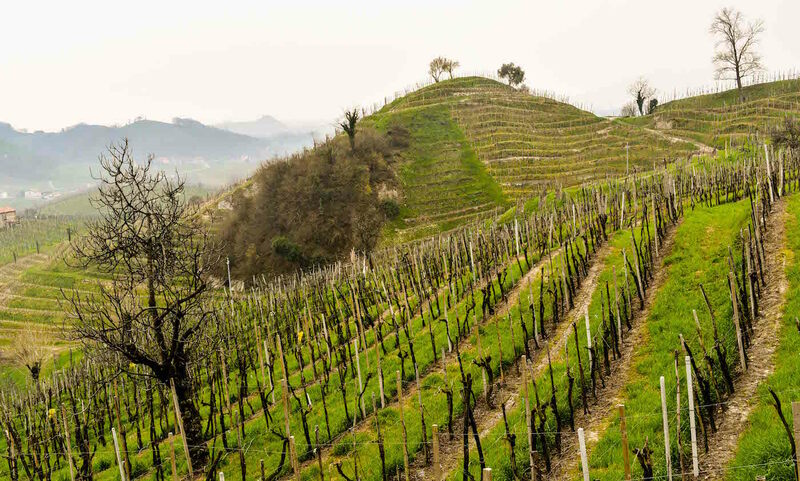 It traverses the Valdobbiadene DOCG region to historic Conegliano, and is a wonderful way to while away a few days, touring through pretty villages and historic towns with an occasional sip of bubbly along the way. A great central place to stay is the Hotel Villa Abbazia at Follina (see review here). 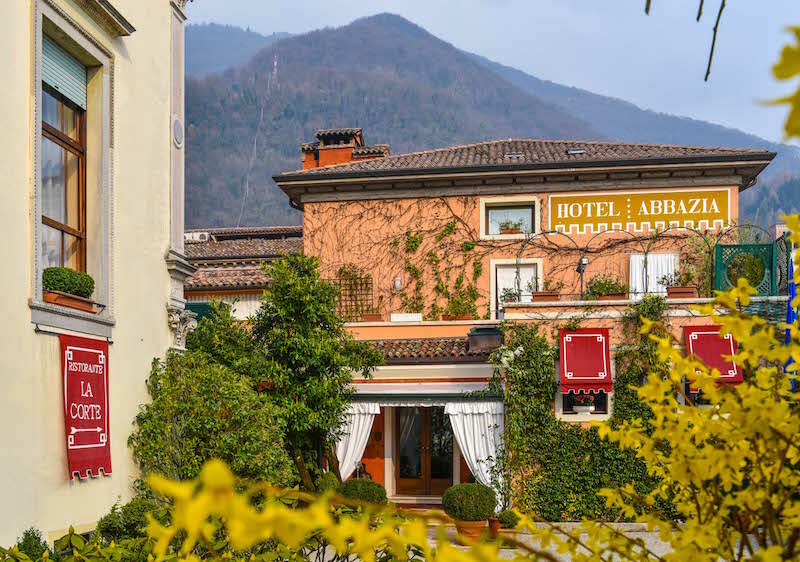 A delightful historic hotel with pretty gardens and acclaimed michelin-starred restaurant La Corte (see their risotto recipe here). A visit to the region can be combined with a stay in Venice or lowland cities like Padua or better still a tour in to the nearby Dolomites. We took a bespoke bespoke tour – offered all year-round – which can be taken through the Prosecco region before climbing up to Cortina and the Sella Ronda in the Dolomiti mountains. CELLOPHANELAND* were guests of Dolomite Mountains who arrange a wide variety of bespoke tours within Veneto and the Dolomites.